Shopping for Simpsons Tin Toys? Made in the style of an old carnival game, this all tin toy features Scratchy as he measures his strength at Itchy's expense! 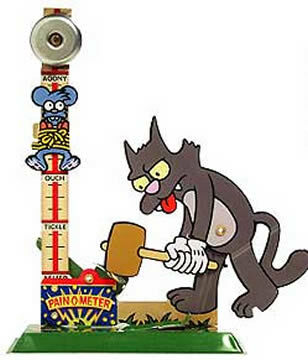 A release lever holds Scratchy back and when released he slams the hammer down, sending Itchy up the Pain-O-Meter to ring the bell. On the way up the pole, Itchy zooms past 5 different measurements of pain: asleep, tickle, ouch, hurt and agony! Stands approximately 7 inches tall and 5 inches wide.